Target offers you a huge selection on products in a variety of categories including clothes, Home, Bed & Bath, Kitchen, Furniture, Toys, Electronics, and Health. Cash back is not available for Cartwheel purchases, Baby care (diapers, wipes, formula), all gift cards, school & office supplies (paper & art supplies), Pharmacy (including OTC), Sweet JOJO, Target Photo, Apple, video games and consoles, toys, contract mobile phones, books, magazines, music, sports and fitness equipment, grocery (food, beverage and household commodities), pets, health, personal care and beauty items etc. Subject to merchant feedback. 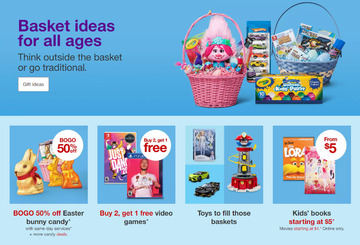 Click a Coupon or click Start Shopping to earn Up to 1% Cash Back at Target.